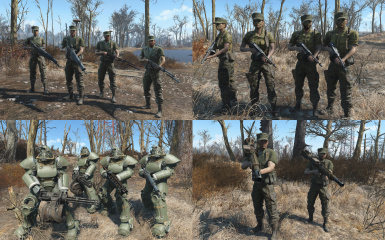 A couple of military outfits made with different combat gear put together and 5 different reinforcement squads which can be called in with flare guns. Under no circumstances may this mod be edited and re-uploaded on Nexus or any other site. Nor will I allow any part of it to be used in another mod without my permission. A big thanks goes to all of the following who've helped me with my mod, the people who's programs I've used to make it, and to those who's tutorials I used to get started. And of course, all of you who've downloaded and supported my mod. BrowncoatGarrus and valdacil for mod advice and everyone on the forums who has helped me. Caliente for letting me use their CBBE mesh. Bethesda Game Studios and the Creation Kit, Blender, Gimp, DDS plugin for Gimp 2.8 by Alexandre Prokoudine, NifScope, Bodyslide and Outfit Studio by Ousnius and Caliente, Bethesda Archive Extractor by jonwd7, Material Editor by ousnius, FO4 Voice File Reference Tool by greentea101, and MultiXwm by Raxdiam. 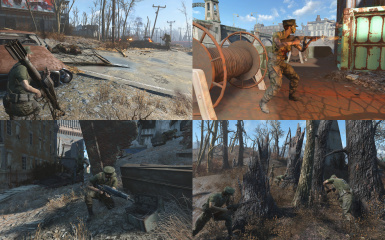 The Creating an armour for Fallout 4 tutorial from the Nexus Wiki, Arideya’s guide to modding FO4 outfits, outfit mashups by Arideya, Adding Transparency to Item by Cat_Woman1989, Fallout 4 Creation Kit Tutorial - NPC by Seddon4494. A lot of optimizing and clean up went into 1.8. 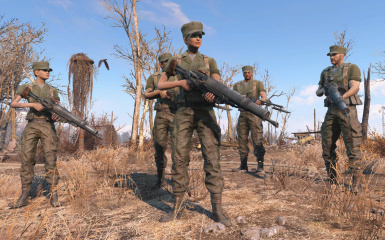 There are no new outfits or new squads; you can improve the fatigues though with number of linings--15 in total. 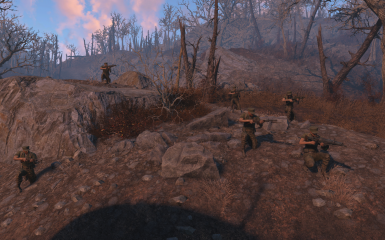 - Remade the Infantryman squad reinforcements so it does not conflict with the vanilla Minutemen flare reinforcements anymore. - Various other things cleaned up in the ESP. 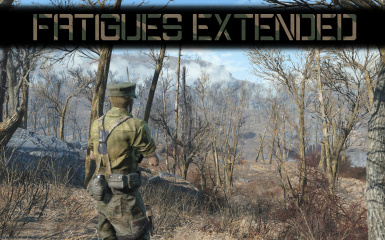 The Fatigues Extended ESP doesn't need to be above Unlimited Companion Framework anymore in the load order since the conflicts have been fixed. - Almost all the outfits are using vanilla texture paths now which eliminates the need for packing in textures and results in a much smaller file size. - All the fatigues and the Combatant's Cap can be upgraded with 15 different linings. - Flashpoint Helmet has been removed. Sorry but it was getting cluttered and I don't want to support it anymore. - The damage of the Special Forces sub-machine guns has be increased. Added in infantry reinforcement ability. Added non-CBBE patch for non-CBBE users. Added in new outfit: Communication Officer's Fatigues. CBBE support added. You will need CBBE now if you want to use the female versions of the outfits. I've converted all the outfits to half sleeves; adds to the military look. Thanks to Lebo24 for this idea. Fixed more bone weight bugs and some out of place vertices. Added in Ammunition Carrier's Fatigues, Combatant's Cap, and Flashpoint Helmet. More stretching bugs fixed. 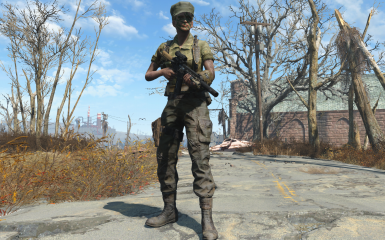 A couple of military outfits made with different combat gear put together. I've mixed in the Harness, Army Fatigues, Combat Armor Chest Piece, Submarine Uniform, weapon magazines, along with other things. I hoped to get something which wasn't just plain fatigues but which also wasn't very armored. Special Forces' Incursion Fatigues - For behind the line operations, incursion, and infiltration. For the most elite wastelander who's willing to go one man army. Officer's Combat Fatigues - Only the most hardened and disciplined wastelander gets to wear these. Combat is their profession. Ammunition Carrier's Fatigues - Packed and strapped up with bullets and magazines this combat gear will keep the entire squad resupplied for firefights to come. Communication Officer's Fatigues - Fitted with a field military radio the communication officer's job is to coordination with other squads in the field and call in backup when necessary. Combatant's Cap - Let's face it--berets aren't meant to be wore into combat. Here's something more appropriate. 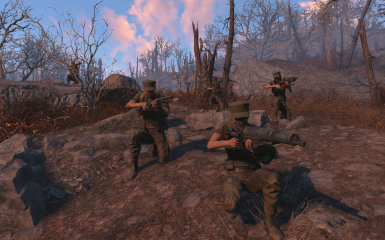 With 1.6 I introduced the option to bring in the Infantryman squad with the flare gun, now with version 1.7 you can bring in 4 more new squads. Infantryman - A four man fireteam armed with fully automatic combat and assault rifles and fragmentation grenades to flush out any stubborn foes. Commandos - Special forces commandos armed with rapid firing sub-machine guns. Very effective and flexible in urban zones. Mechanized Shock Troops - When you need a large amount of firepower and serious protection. Minigun and Gauss Gun welding troops clad in T-51B power armor. Support Troops - A two-man squad with targeting missiles launchers provide a higher degree of lethality to deal with tougher enemies. Caution is advised in urban areas because of the high explosives used. Conscripts - For the sole purpose of taking a position by sheer numbers, conscripts are armed with mediocre weapons and armor. Unlike other squads conscripts can die. To dismiss, talk to the Conscript Leader. All of the squads can be called in at the same time. Each squad has their own flare gun and ammo which can be crafted at the Chem bench under REINFORCEMENT FLARES. The soldiers and the player have been voiced with vanilla dialogue and have LIP files which synchronize the mouth and the voice. So there's absolutely no mime hand gestures and only subtitles accompanied by eerie silence. They can be traded with, dismissed, and called again with the flare gun. 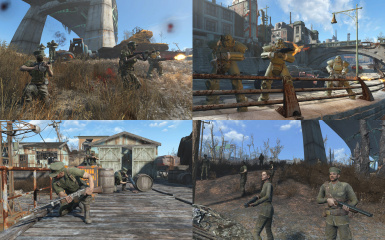 For the reinforcements to work you will need Unlimited Companion Framework mod by Expired6978. It's a good mod which works well with this. The squads can use and carry your things but be sure to take them back before dismissing them otherwise they'll be gone for good. - The damage of the Special Forces submachine guns has be increased. There are two ways to get the items--make the craftable versions or get them through console. 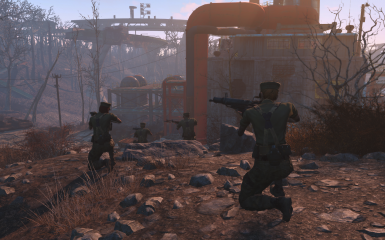 You can build the fatigues at any chem station under COMBAT GEAR and the flares and flare guns are built at the same place under REINFORCEMENT FLARES. P.S. 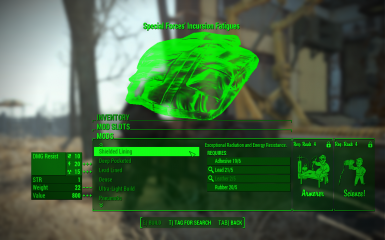 This mod will not be coming to console. I'll port it over when I find time. I plan on making my mod compatible with CBBE in the upcoming version 1.5. Vanilla version for non-CBBE users. In the process of making an addition to this mod in which players will be able to call in reinforcements through the flare gun. These squads will follow you and provide support and you'll be able to outfit them with your own equipment. More specialized reinforcements. Shock troops, commandos, conscripts, and rocket squads. More squads with more interesting arrival methods. I hope to make more variants of the fatigues with different things mixed in so stay tuned! Edit: I've taken a break from this for now so there won't be anything new added to this mod. For the reinforcements option to work you will need Unlimited Companion Framework. The main files are already CBBE compatible, if you don't use CBBE download the patch. 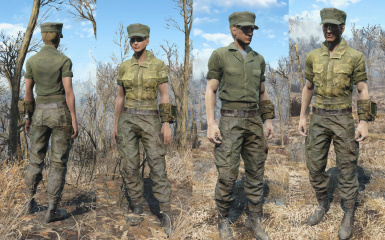 The fatigues are added in new items and shouldn't conflict with anything. The Special Forces use a custom face paint and this will conflict with any other mod which adds its own. Whichever one is below the other in the load order will get priority and that's the one which will work. 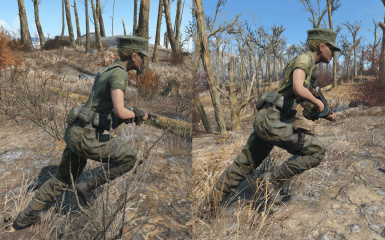 This mod is not compatible with AWKCR in the sense that the changes it makes are not applicable to the fatigues. E.g. fatigues are not made at the armor bench but instead at the chem bench. There should be no conflict between the mods. When you try to use the flare gun in some areas you might get the error message saying, "Reinforcements are out of range." Just move to a new area and try again there.